Addressing the reporters here at the BJP state headquarter on BJP party manifesto, Rijiju said that there will be a special provision for the Northeast before its implementation and the National Register of Citizen (NRC) would also be introduced in the entire region by next five years. 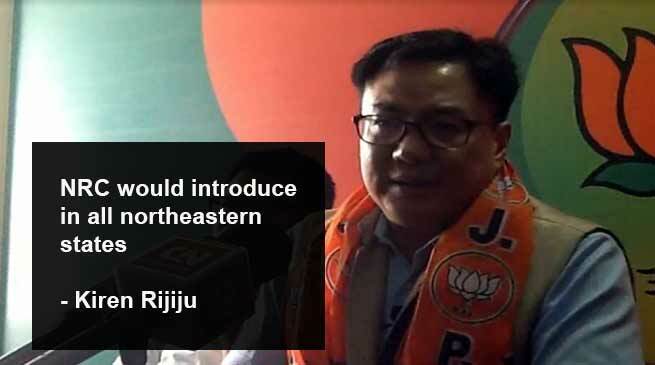 Will it affect the election prospect of the BJP in the northeast, Rijiju said that state like Arunachal, Mizoram and Nagaland are protected states have little to worry about. On NRC issue, Rijiju said that only indigenous people will be registered and it will stop illegal entry of immigrants to the country. The minority communities, who will arrive as victims of persecution can get citizenship anywhere in India, but for the Northeast, they will be brought only after special provisions are made.” Rijiju added.